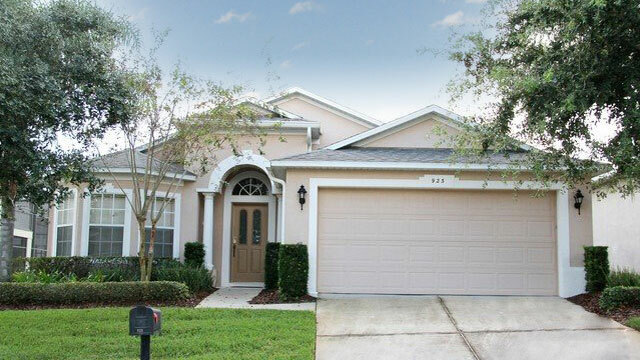 My House at Disney is 4 bedroom/ 3 bathroom vaction rental, located in Orlando, Fl. It has been equipped and built to the highest standard to ensure that your vacation contains all the appliances and comforts you would expect as if it were your own. 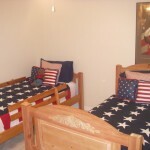 Bedrooms 1 and 2 are Master Suites – they have queen sized (5ft) beds and have their own separate bathrooms. 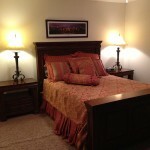 Master Suite # 1 – Boasts custom bedding with all new furniture and new, pillow top Serta mattress. A full size crib has been provided, also with custom bedding. We have installed a new TV with remote (32 inch) with VCR/DVD player, which are both located inside the matching armoire. Custom window treatments and custom made pillows all to match. Huge master bath with separate tiled shower. Garden tub and 2 sinks. Huge master closet. Toilet is separate behind door across from shower. Overlooks heated pool. Master Suite # 2 – Bueen bed, TV and designer fabrics. There is also a chaise lounge that would sleep a small child. Private bath. Bedroom 3 and bedroom 4 – Both equipied with matching twin beds. Bedroom 3 boasts “Rooms that Rule” bedding (from Dillards) and custom window treatments, whilst Bedroom 4 has been finished with Ralph Lauren bedding and custom pillows. There is a 3rd bath between these bedrooms. This villa will sleep up to 11 people, plus additional younger guests could be accommodated on the chaise and in the crib. Living Space – The interior of the house is designed, decorated and luxuriously furnished by a professional interior designer. Most of the furniture was ordered from the Dallas Furniture Market. Family room has queen sleeper sofa, sleeper love-seat, and leather rocker/recliner. Glass doors lead to lanai. The entertainment center includes a new 32″ HDTV, flat screen TV. DVD player (also plays CD’s) VCR and X BOX. Games, movies, books and magazines are provided. 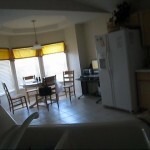 Kitchen – Fully equipped and decorated. French fabrics, Denby pottery, full size refrigerator with a water filtering system have been added. Ice-maker and water are located on the front of the refrigerator. Dishwasher and microwave. Separate Laundry room. Swimming pool – Measures 28ft by 14 ft, is fully screened and has beautiful Taylor Jordan furniture. There is a double chaise sun lounger and a single chaise. Both are very thickly padded and covered in the Sunbrella fabric. The matching glass top table has 4 swivel, rocker chairs that also have very thick cushions on the back and bottom. All of this furniture is heavy iron and is gorgeous. We have recently added swim vests for the security of our younger guests whilst enjoying the pool. 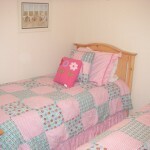 Bed linens and towels are provided for your use, along with large towels, perfect for the pool. We have provided for the younger members of your party by providing two strollers – one a Maclaren and the other a heavy-duty, umbrella type, a high chair and a car seat. Parking – There is a 2 car garage, make sure all parking is done in driveway or garage and not on the street. The HOA is strict about the street being clear, especially after dark. There is a phone installed, with free local and nationwide calling. Wifi – For your convenience, we have installed a HP Touchscreen PC with printer and high-speed, wireless, internet access. Either make use of the PC or bring along your laptop. Keycode access – No driving further to collect keys. Key code is issued upon payment of rental rate balance. To see more pictures of our fantastic villa please visit our gallery.